The Robots are Taking Over the World! The good news is, they’re on our side and here to do all the jobs we dislike. Robotic vacuums are the ultimate cleaning tool, you can literally just set it and forget it. Some devices will even navigate through doors and into separate rooms before backtracking to their charging station when the battery is getting low on charge. To help you find the right robot vacuum for you, we’ve taken time out to research the best of the bunch on sale right now. We think a robotic hoover would make a great geeky gift, which is why we’ve included it in at least one of our top ten lists. There are dozens of different models available to buy and choosing the best one that suits your needs and budget is no easy task. Below we’ve listed the key features you should look out for. Check each product to see if it meets your cleaning needs and is within your budget. Many robot vacuums have a feature where the device will automatically head back to its charging station when the battery is low. You never need to manually set these vacuums to charge. A battery with more storage capacity will mean your device can clean for longer between each charging cycle. If you live in a large home, choose a device with the maximum amount of storage. A basic robot vacuum will work at the press of a button but if you want to automate the entire process, choose a device with a scheduling feature. Pick your start and finish times to suit your lifestyle. Not all devices can navigate through multiple rooms and make it back to the charging station. If you live in a large property and want to fully automate your hoovering, look out for the multi-room icon. Some pets can shed an incredible amount of hair and fur which can clog the device. Entanglements can also prevent your hoover from working efficiently. Look out for the pet-friendly icon. Robotic hoovers can nudge against furniture, which over time, can leave scratches, dents and marks. Look out for the bumper icon if you want one with a soft furniture-friendly bumper. If you want to control your robot hoover via a mobile phone app, look out for the app icon. You can activate, cancel and schedule cleaning cycles from anywhere in the world at any time. Different vacuum filters achieve differing results, some can even reduce the suction power of the vacuum. Look our for pet-friendly and HEPA filters when choosing your next robot hoover. There are so many devices to choose from, it’s easy to get overwhelmed. While many of the hoovers look similar, they each have their own set of features. The team here at Gifted Geek has reviewed all of the robot hoovers we could find and have narrowed our list of preferred products to just the six listed below. While the Ecovacs Deebot Ozmo 930 is at the top of the price range, it has almost unrivalled features including mopping and spot cleaning troublesome areas. The device will create a fully interactive map as it makes its way around the home. Unlike many cheaper variants, this product covers every inch of the floor. The Housmile Robot Vacuum hoover lacks many advanced features such as mopping, interactive mapping and self-docking/charging but this entry-level robot cleaner is powerful and robust. This robot is Ideal for shallow low piled carpets and lifting particles from hard floors. 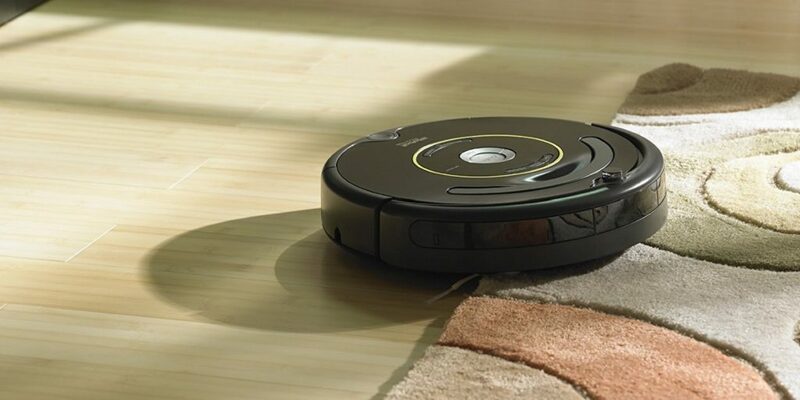 The Robot Roomba 605 is a versatile machine that can efficiently clean all the different floors of your home. Inbuilt sensors allow it to adjust position as it moves effortlessly from hard surfaces to carpets and it can climb over rugs with ease. Powerful suction capabilities effectively removes debris including hair. The Roomba cleans every part of your floor space with the help of an additional rotating side brush, ensuring dirt and debris is removed right up to the skirting board. Responsive navigation through iAdapt allows it to move around obstacles. A sensor detects the presence of stairs which prevents the Roomba from falling down. Cleaning time can last up to 180 minutes thanks to the Xlife formulation of the battery. The robot comes to a stop when the dust container is full and returns to home base if the battery is fading. Recharging takes place automatically. The Roomba is available in a silver design. The Housmile comes equipped with two operating modes. You can choose to run the robot for 30 minutes in small rooms or 60 minutes in large rooms. The Li-ion battery delivers a total of 90 minutes of sustained power and recharges automatically at a rate of between three to five hours. Side brushes allow the robot to thoroughly clean every inch of floor space and it has multiple cleaning modes. With the aid of a fitted dam-board, it effectively removes all types of debris including pet hair. The Housmile’s low design enables it to clean in difficult areas such as beneath beds and cupboards. The robot uses infra-red sensors to avoid obstacles such as chairs and to ensure it never falls down the stairwell. Superior HEPA filtration effectively removes micro-particles of dust, including harmful allergens and bacteria, leaving your home clean and healthy. An AC adaptor and a cleaning tool are included. The silent running operation enables the ILIFE to carry out its duties without startling your pets, while the powerful suction removes pet hair without it becoming entangled in the system. Two side brushes provide extra cleaning capabilities. The robot includes a programmable feature that allows it to clean your home at any time, even when you’re asleep. Smart technology ensures a smooth navigation to prevent it falling down the stairs and to move without bumping into objects. At just 3.3 inches tall, it can effortlessly clean under beds. It includes a remote control device with different operating modes that ensures cleaning is thorough and effective. The dirt collection container has a capacity of 0.3 litres. A powerful Li-ion battery provides a maximum of 120 minutes of cleaning and it automatically returns to the base when the task is completed. Charging time is between 250 and 300 minutes. The ILIFE has an overall diameter of 11.8 inches and weighs 4.28kg. The robot is available in white. This award-winning, multiple function robotic vacuum has a powerful suction that can deal with hard or carpeted surfaces. It includes a deep clean mode that works in conjunction with a V-shaped beater brush to ensure that dirt is effectively lifted from carpets. A sensor automatically detects objects for ease of navigation and to prevent it dropping down the stairs. A smooth operation is achieved through the ECOVACS App which allows you to customise the robot’s work schedule. It can also be operated through a smartphone or tablet and responds to voice commands via Alexa. The Deebot M81 also automatically converts to a floor mopping cleaner. It includes a washable, reusable floor cloth and a water tank that can be removed. The robot has a running time of 100 minutes and automatically returns to base when the battery power begins to fade. The ECOVACS App provides the Deebot Ozmo with a superior, Smart technology mapping capability that scans the details of every room to ensure the smoothest of operating systems. Instructions can be set through your smartphone or Alexa voice control. The versatile Deebot Ozmo features both wet and dry floor cleaning options and can operate both systems at the same time for greater efficiency. It automatically detects carpets and rugs where it can use a powerful double strength suction to ensure that even deep-seated dirt is removed. Hair can be lifted without becoming tangled in the mechanism. When operating the mopping system, the robot automatically avoids any carpeted areas. The water flow is electronically controlled to ensure an even coverage. The height of the Deebot Ozmo is 7.9cm and the weight is 4.6kg. There is a total running time of 110 minutes and a decibel level of 65. The wet and dry Proscenic 811GB has versatile operating modes that can be accessed through the Proscenic App. Timing and boundary schedules can either be programmed, voice controlled through Alexa, operated via remote control or by using the manual buttons on the robot. Weighing just 4.4kg, it has a low operational noise level that allows you to still hear conversation. A powerful suction and side brushes combine with up to four cleaning functions to ensure edges or large areas are cleaned effectively. The Proscenic features HEPA filtration that removes dust, bacteria and allergens to create an unpolluted atmosphere. The mopping function is controlled electronically, operating at three different speed levels and the water tank is guaranteed not to leak. Reusable cleaning cloths are included. The robot is capable of operating both vacuuming and mopping functions simultaneously. The Proscenic is blue in colour and the total cleaning time varies between 110 and 130 minutes.